The weather's warming up. It's time to have F.U.N.! We show you how to have some MacGyver fun making your own camping stove out of spare soda cans. Who else deserves to have more fun than mom? Make Mother's Day a blast by giving her a break. We've got super easy recipes even dads can make! And for the single gals out there, join Emmy award winning journalist - Julia Yarbough - on her fabulous road trip across America, in search of a husband! Take a leaf out of Julia's book and hit the road. Whether it is to find love, to have fun with friends or just to spend some quality time with your kids. Meet Julia Yarbough, a modern day woman on a mission - to find a husband. She is accomplished in her career as an Emmy award winning broadcast and print journalist, surrounded by great friends, embraces adventure with arms wide open and isn't afraid to stand on her own two feet. What's missing? Mr. Right. That's why Julia is hitting the highway in search of her dream man. Dating has never been so adventurous! p.s. not your usual burnt toast and beans on the menu! Hybrid RV's: Concept to reality? If an RV could get the same gas mileage as a van would you buy one? As gas prices have risen and the green movement has pushed environmental concerns to the forefront of the social conscious a few RV producers have taken note. Their answer: the hybrid RV. Do I need to register my camper trailer in NY State? Yes, camper trailers must be registered in the State of New York. Simply follow the steps below in order and you should be registered and ready to hit the road in no time. When you set out on an RV trip you have to pick and choose what you're going to take. With space restrictions it simply isn't feasible to bring along sports equipment that will be used once in a blue moon, which monopolizes precious storage space. But if you think outside of the box for a second, you'll realize there are a host of sports that require little equipment. The Ozarks, otherwise known as Ozarks Mountain Country, the Ozark Mountains, or the Ozark Plateau, are a nature lover's paradise and a playground for children. This highland region of the Central United States spans four states and provides a variety of geographical terrain, including mountains, forests, caves, and lakeside bluffs that offer recreational opportunities for all ages. Camping is all about the great outdoors...and the cool gadgets! What better way to impress your buddies then making a soda can camping stove with stuff you have lying round the house. Two soda cans, sandpaper, razor blade, fiberglass and thumb tack is all it takes. Less than 10 minutes later you'll have a flaming camping stove that weighs less than an ounce and perfect to throw in the back pack. 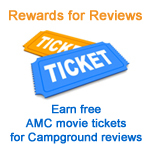 Search each state and view campground and RV park reviews, photos, videos and more! ©2010 Camping Road Trip, LLC. All Rights Reserved.